output is available at the rear panel. Wavetek 2500 family of instruments. All operational controls are located on the front panel. status are indicated on a two-line LCD display. with 10 Hz resolution and .00025% (2.5 ppm) accuracy. Frequency aging is <1 ppm/year. 400 or 1000 Hz rate. AM depth is specified from 0 to 100%. used as an external reference input. with an accuracy of ±1.5 dB of the actual measured level. Level resolution is .1 dB. power protection to 50 watts is standard. was removed, except the RF output will be off. 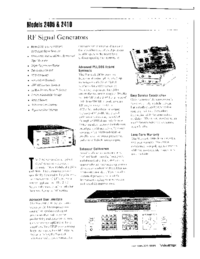 RF Signal Generators contains eleven sections. electrical circuitry, and operate identically. panel controls, connectors, and displays. verify operation at the limits of specifications. THE FOLLOWING SECTIONS ARE MISSING! 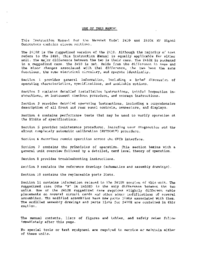 Section 6 describes remote operation across the GPIB Interface. card level theory of operation. Section 8 provides troubleshooting instructions. 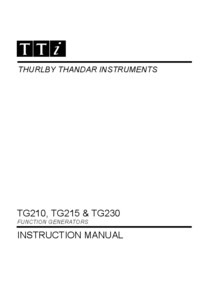 and parts lists for 2410R are contained in this section. notes follow immediately after this page. or maintain either of these units.